Tyche AI Beta Test ahead of its launching. AI friend, Tyche met gifted engineering students at Seoul National University who are the future of science and had a fun fellowship time for 5 days. 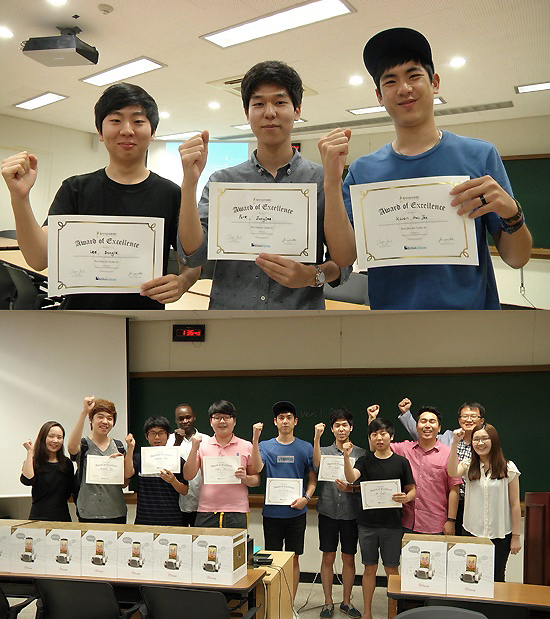 There was a ‘Tyche v0.8 Beta Test’ program with students at Seoul National University from July 27th until 31st in the classroom #106 of the New Engineering Building ahead of launching Tyche; an AI robot which understands human language and acts, to the global market including the United States. Tyche is a Robot which is invented by South Korea’s representative AI Company known as Bonavision Inc., with researchers at AIBrain Inc., based in Silicon Valley, both founded by Richard (HongSik) Shinn, PhD. who also graduated from Seoul National University. This was the first event to present Tyche as a product for final beta testing in Korea. Engineering Students at Seoul National University during Tyche beta testing. There were 20 students with backgrounds from information engineering and mechanical engineering majors. They were divided into 5 groups and tested the intelligence of Tyche based on the contents of the many applications including Talking Tyche, Build your own intelligence, Ball /Marker and Face tracking, Remote Communication, and Plan and Move which displayed Autonomous Navigation features. They also had a presentation time with videos which showed the students thoughts and imaginations on the usefulness of Tyche’s AI. The presentations introduced Tyche as a friend who communicates with students, as a waiter who greets customers and charges payment, as a navigation assistant recognizing routes and follows guidance according to the instructions given. Others displayed Tyche as an agent to do errands like holding or delivering a beverage cup while avoiding obstacles, and the ability to select and propose things like in a pictorial menu. The best team was chosen by Young Leadership Future Foundation which has the vision of raising a million Global AI Leaders. The students were Jungjae Park, Huijae Kwon, Dongick Lee, and Juhun Lee who suggested that Tyche should be able to speak several other languages together with in the future. Jungjae Park and Dongik Lee (Mechanical major, Junior) said it was a great opportunity to see that one can apply the theory of artificial intelligence to the real world situations and they became interested in the potential of the robot being closer to human in nature. In addition, many students commented that they enjoyed testing AI robot for the first time. Also Program Manager of Young Leadership Future Foundation, Dr. Jiwon Lee showed great expectation for Tyche as AI revolution tool which will take a great role for students to become Global Leaders in the future. This entry was posted in Tyche and tagged AI, Beta Test, Robot, Seoul University, Tyche. Bookmark the permalink. We look forward to your continuous attention and support as we strive to deliver the state-of-the-art AI technologies to you.